Operational amplifiers have a very broad range of application. This book focuses on the fundamentals which are applicable to many applications. 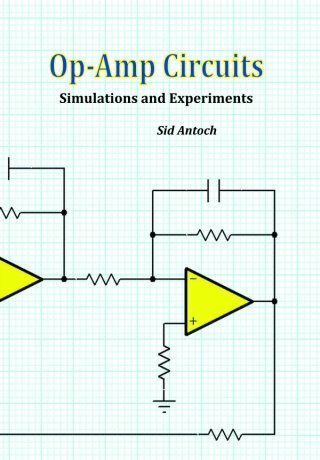 All of the simulations and experiments demonstrate basic operational amplifier principles. The experiments may be easily modified and may serve as the basis for other applications. This book may be used as a circuit design and application reference for hobbyists, experimenters, and students. It may also be used as a supplement to a college level operational amplifier course and laboratory. An understanding of electric circuit analysis, semiconductor devices, and college level algebra are pre-requisites for this book. Simulation examples are presented using LTspice, a simulation program available as a free download from Linear Technology. TINA-TI, a simulation program available as a free download from Texas Instruments, is also introduced. Experiments provided may be performed using a solder-less breadboard, inexpensive parts, a small power supply, and a digital or USB oscilloscope. Some experiments also require a function generator. The circuits are provided in their basic and simplest forms. The experimenter may modify and augment the circuits as needed for particular applications.